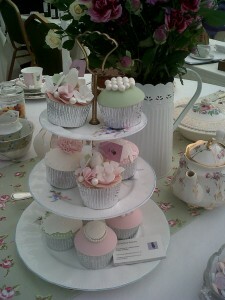 Hi…had a lovely day today at the Ludlow Castle/Fishmore Hall wedding fair. Great to see lots of brides and grooms to be and a great chance to catch up with some of the other lovely suppliers. Our friend, the incredibly talented Chris from Dulcie Blue Bakery made these amazing cupcakes for use on our stand….everyone commented on how beautiful they were…here is just one pic for now, will post more later.